3. From the Search Criteria, Data Fields, Data Format, or Media tab, click the New Search button under the Search list to launch the New Search wizard. 4. Select a class and click Next. 5. Select the search criteria (see Selecting Search Criteria) and click Next. 6. Select the fields to download (see Selecting Download Fields) and click Next. 7. Specify data download options (see Download Settings) and click Next. 8. Specify media download options (see Media Download) and click Next. 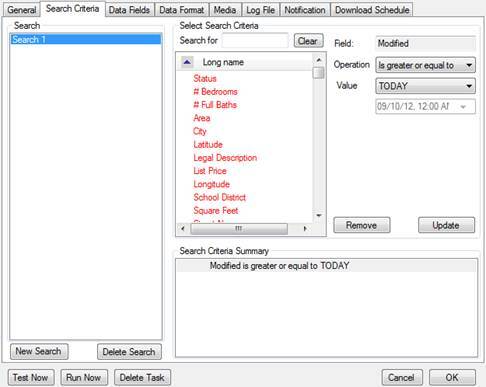 The new search is added to the current task and can be accessed from the Search list on the Search Criteria, Data Fields, Data Format, and Media tabs.